Despite early predictions of it's demise, Old Dominion Brewery in Asburn, VA continues to produce new and interesting beers. When this Virginia establishment was sold to a group comprised of Fordham Brewing and Anheuser-Busch, the brewery's obituary was penned by many commentators. As we now know, those predictions were unfounded. Old Dominion brewers continue to produce new and interesting beers. On the first Wednesday of each month the brewery hosts "Taste from the Tanks". These events give visitors the chance to talk to the brewers and get preview tastes of upcoming releases. Though I've not had the opportunity to attend, I've read many glowing reports of both the events and the beers themselves thanks to attendees who post their experiences to the DC-Beer mailing list. One beer that was previewed at "Taste from the Tanks" and is now on store shelves is Old Dominion Beach House Golden Pilsner. This beer from brewer Favio Garcia is a Czech Pilser made with Perle, Tettnanger and Saaz noble hops. According to reports from "Taste from the Tanks" attendees, this beer is dry hopped for extra flavor and aroma. The beer received good reviews from folks who attended the preview, and the flavor was compared favorably to the old Tupper’s Pils by one reviewer. 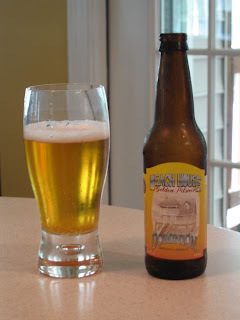 Beach House Golden Pilsner pours straw-yellow with a bright white head that drops fairly quickly. The aroma is that of grain and some breadiness, along with faint hops. The flavor is bready malt with a strong hop bitterness. The finish is quite dry. I had my beer with a simple hot dog lunch. (Not all beer and food pairings have to be gourmet.) What better summer food to have with a summer beer, especially on this 100° day. I enjoy my dogs with mustard, ketchup, and a bit of relish. The bitterness of the beer stood up quite nicely to the bitter flavors of the relish and mustard. I ate my lunch in the comfort of air conditioning, but perhaps next time I'll enjoy Beach House Golden Pilsner outside, by the grill. I'll have to try this beer. Personally, I have found labels like "golden" to be a red flag for a product that is attempting to have too broad an appeal. It will be refreshing to find this is otherwise. Beach House beer release party on May 3rd, 2012 at the Rams Head Restaurants in Maryland. $4 glass with $1 each additional pour during the release. Cheers!